Looking through social media and websites that focus on outdoor adventuring, I see the most incredible people doing wonderful things: rock climbers sending difficult routes, kayakers running waterfalls, backpackers, photographers and even people doing yoga by a scenic rock a top Angel’s Landing. A smile widens on my face as I watch outdoor people doing things I often daydream about. However happy the moment, there’s also a small sting of disappointment. Looking through outdoor magazines, blogs, and social media I rarely see anyone who looks like me. I’m not talking about race—although I am a proud Afro Latina. What I don’t see are other skydivers. Skydivers experience the outdoors in a way unique to most of the world; from heights around 13,500 feet at speeds that easily surpass 120 mph. This doesn’t make us extreme—it makes us really in love with each brilliant sunset. It doesn’t make us adrenaline addicts, it means we follow cloud formations and weather fronts with the enthusiasm of your local flying club. The sky is something we’re passionate about. That may look like offsetting our carbon footprint, fighting the privatization of air traffic control or simply enjoying a weekend of camping at a local drop-zone. For many of us, skydiving was our introduction to the outdoors; a gateway that bridged our lives in major cities to new outdoor experiences in small towns, campgrounds, and state parks around the U.S. The skydiving market for outdoor goods such as camping gear and base layers is huge, yet outdoor retailers such as REI, Outdoor Research, MooseJaw, The North Face, etc. mostly overlook skydivers in their advertising efforts. Skydivers also have the ability to inspire the public’s imagination yet currently the only outdoor brand that I’ve seen showcase skydivers is Kavu. It makes me wonder, what does the general public think of skydiving? Why aren't we considered to be part of the outdoor community? Although we soar through the sky we are deeply rooted in experiencing the outdoors—all of it! Carliz Paez B.A.S.E. jumping during Bridge Day at the New River Gorge in Fayetteville, West Virginia. On a clear sunny day the drop-zone (DZ) is like a second home for skydivers. Most DZs are located on small airports in rural areas around the country. For the average urban millennial, the trip to the drop-zone is it's own experience. There's something special about leaving the city behind and falling in love with big sky, open fields, farms and forest all over again. We then experience the same spaces from the air and gain a deeper understanding of the importance of conserving them. For those skydivers who have progressed to more specialized forms of the sport such as wingsuiting, B.A.S.E. jumping, and speed flying the connection with nature is even stronger. These disciplines often require difficult ascents through beautiful mountainous terrain which in turn has brought us to interact with Nature in a deeper way. For example a friend of mine, Carliz Paez, recently learned to speed fly at Joshua Tree National Park. He also snowboards, B.A.S.E jumps, skydives and ferries private planes—contrary to the stereotype that skydivers are single minded adrenaline addicts with zero interest in other outdoor activities. So many of us grew up with limited exposure to the outdoors, other than school athletics, and learned to love it through skydiving. I started skydiving first and then began climbing with friends I met through the sport. I also got into hiking after a excursion to Moab that took place during a skydiving trip to Utah. Moab is home to B.A.S.E jumpers, slackliners, climbers, and skydivers alike. We all experience Nature in our own way however skydivers seem to be singled out for exclusion from the outdoor community. As a more novice skydiver I see my peers achieving these activities in nature and it makes me want to experience it too. You don't have to B.A.S.E jump or speedfly to be immersed in Nature. Seeing a friend explore a national park makes me want to go there too. In that way skydiving is a door that opens up opportunities for people who want to experience the outdoors in a different way. It’s especially effective for people who may not consider themselves outdoorsy. I for sure wasn’t! Free-fall lasts only sixty seconds. Even if I do five or six jumps in a day that’s only five or six minutes spent hurtling to the ground at 120 mph. The rest of the weekend is spent sitting by a bonfire, listening to the sounds of the wind rustling the leaves, watching a beautiful sunset as I slowly steer my canopy back down to earth and sleeping under billions of stars each night. We pass mason jars around campfires, go for nature walks, go swimming (sometimes unintentionally) and don't feed the wildlife. If you visit any medium to large sized drop zone on the weekend you’ll see rows of tents ranging from mid-weight to ultralight. You’ll see hammocks and adventure pups and jet boilers. You’ll see summit selfies taken 13,000 ft overhead with GoPros—yes, but also by professional outdoor photographers with bite switches and DSLRs lovingly bolted to plastic helmets atop 3D printed mounts. Skydiving photography is outdoor photography. Skydiving is an outdoor activity. So what will it take to be embraced by the outdoor community? 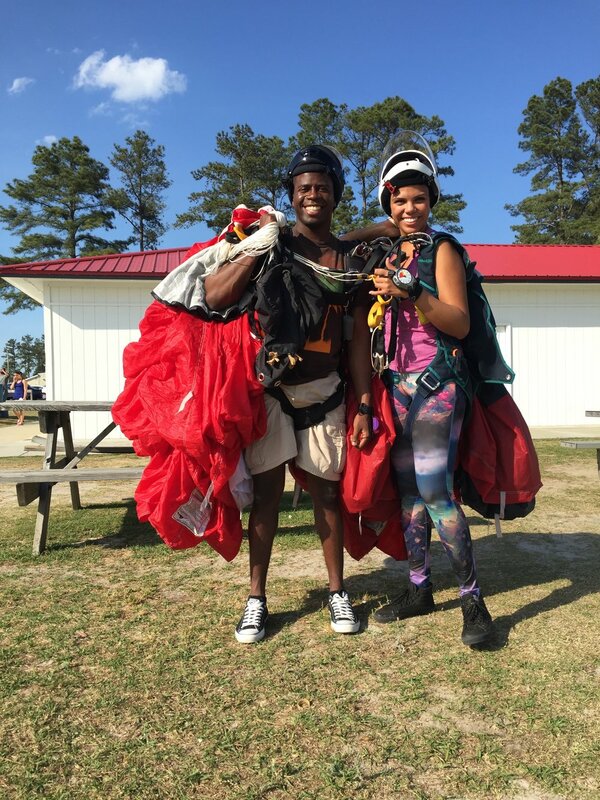 My first time camping was at Skydive Sebastian in Sebastian, Florida. I had no idea how to a pitch a tent and it took me over half an hour just to figure it out! Thank god for my fellow skydiver—Melanin Base Camp creator Danielle Williams, for teaching me how to pitch my tent that first night. I was terrified of sleeping in a tent, but felt much better knowing I had a friend sleeping in a tent next to mine. By the campfire I began to meet others who adopted a traveling skydiving lifestyle; traveling from state to state, camping in different places in order to experience our sport across the US and even internationally. Camping soon became one of my favorite aspects of the sport. As I got comfortable camping at different drop-zones, I realized that there were other places I could camp as well and began to venture to other locations. I have now graduated from an 8lb, $30 basic phi basic tent to a sleek ultralight that I take with me on climbing and back-packing trips to all sorts of places. Grass strip runways, camp-outs and bonfires are all a part of the skydiving experience! Car camping isn’t really camping! Skydivers and B.A.S.E jumpers are reckless thrill seekers—they're not really outdoor people. We’ve heard these arguments before. We also are aware that outdoor companies, through advertising, brand ambassadorships, social media and editorial pieces, have an over-sized impact on 'who' and 'what' is considered to be a part of the outdoor community. By excluding skydivers from the outdoor activities advertised, outdoor industry has closed off the public imagination to such a beautiful way of experiencing the outdoors. The act of human flight. Let’s not restrict the outdoors to a narrow definition: elitist, able bodied, mountaintop experiences only. Let’s define it as it is; vast, diverse, peaceful, exhilarating. And let’s celebrate all forms of outdoor activities whether it’s a walk in your local park, a fishing trip, yoga atop Angel's Landing or a skydive. 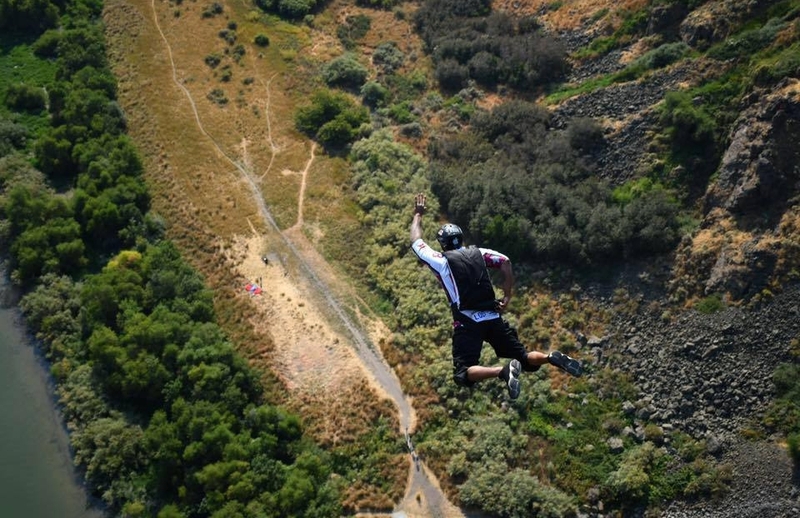 Sports like skydiving which connect urban millennials to big skies, camping and the back-country are incredibly important. Whether you do one jump or 10,000 let us be your gateway to the Outdoors. After a fun day of jumping; Nothing is more wonderful than sitting by the campfire and sleeping under the cool summer breeze.